Jet returns in a series of beautiful animated stickers as he goes about his usual business. With 14 smooth and charismatic animated stickers you’ll find this pack has great variety and stunning value. – Claws pierce their way through the screen and a mean looking eye peers through the gap. But then Jet the Cat pushes his way through the little hole and blinks cutely. Hello, it says. – Jet the cat has a furrowed brow as he sadly wipes a solitary tear from his eyes. He sits sadly. – Jet the cat is walking to the left, but something makes him stop, turn and say, “Huh?” with a question mark. Just submitted to the App Store! Penguin Bo comes to life in 24 action-packed, smooth animations that you’ll fall in love with. Every sticker has been highly optimised to provide detail, clarity and smoothness not seen elsewhere. If you only plan on using one sticker pack this holiday, we’ve got you covered. With 27 varied stickers covering the range from ‘What I want…’ to ‘Season’s Greetings’ to party invites to thank you messages you’ll find something day by day. What’s more, 11 of the stickers are animated stylishly to emphasise their meanings, including a quivering cat’s paw as it reaches for a bird, bobbing houses wishing you a happy new year and a blinking, befuddled Santa. – A cat is reaching out with a quivering paw, trying hard to reach the robin perched on the end of the fir tree branch. The cat says that All it wants for Christmas is that annoying bird. – Penguin Bo has taken his teddy bear to visit his friend, a polar bear, up in the north pole. This sticker appears to be a postcard. Sticker Fab Emoji Maker puts you in control of your emotions as you create unique stickers to represent your current mood and style. That’s it. We said it was easy, and each sticker can take under 10 seconds to make, although some people prefer to take more time in their creative process! – e mow gee sticker with a blue girl’s face with flowing hair and stars on the left cheek, blue eyes and raised eyebrows and puckered lips wearing red lipstick with a pretty lace with flowers in the hair above and thanks in bright pink below. Hand made for you using Sticker Fab. – e mow gee sticker sticker with a big round ball of snow, eyes made out of coal and a happy smile with a sprig of holly with berries above and season’s greetings written in blue below. Hand made for you using Sticker Fab. At launch 8 packs are available as in app purchases, with each one providing over 50,000 possible variations. The stickers you create are totally free for use as stickers in Messages for personal use only. Penguin Bo gets his moves on in this animated sticker pack. 25 hand drawn animations show the baby Emperor Penguin Bo in his best light as he goes about his daily life. – Penguin Bo blushes and then holds his wings to his mouth. Oops. If you like this, make sure to take a look at Penguin Bo’s original sticker pack, or the Sticker Fab app that lets you design your own stickers. Make stickers personal with Sticker Fab, the quick and easy sticker creator you can use right inside Messages. Great companion to its sister app: Sticker Fab Emoji Maker, also on the app store. 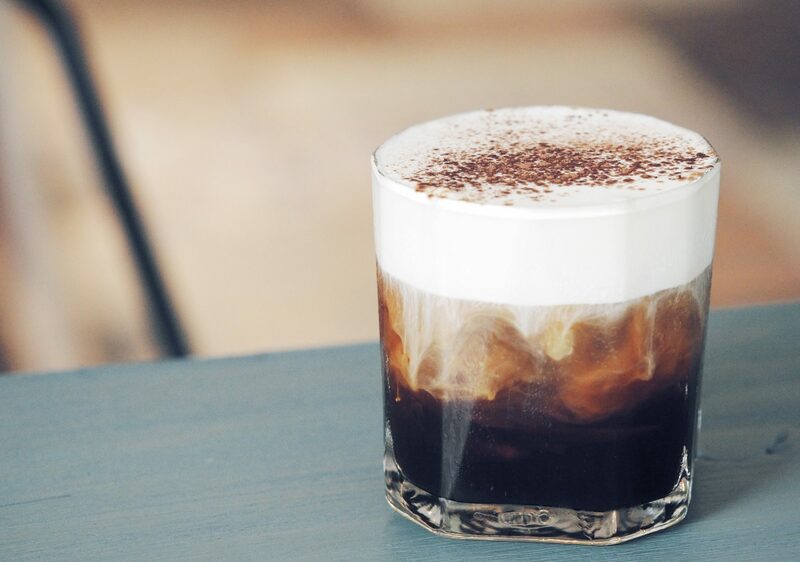 Try them both! 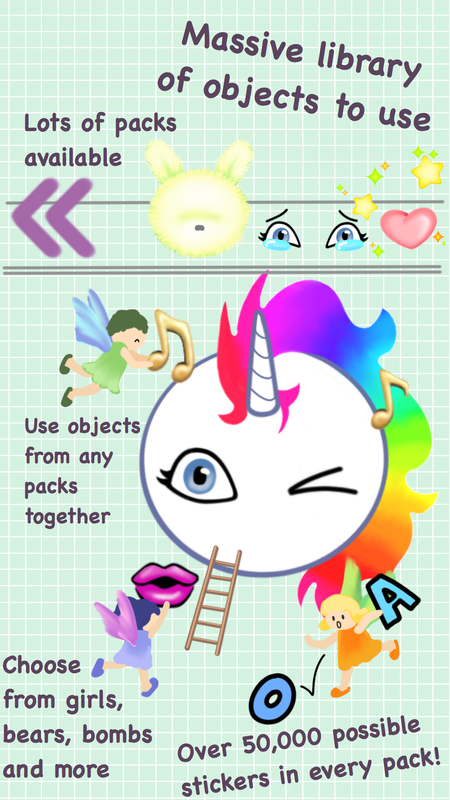 Simply swipe to Sticker Fab and you can use any of your creations just like any other sticker pack. The magic comes from the Add button, which brings up a simple canvas onto which you can place, rotate and size any of the objects available. For free you have access to 3 canvases, characters, accessories and texts, but once purchased you will have over 40 high quality, hand drawn objects, with more bundles becoming available for the price a sticker pack. For a quick personal sticker just choose a canvas, put a character on it, add a message and an accessory and you are ready to send. The process is just the same for more complex scenes, and as they are all saved you can make favourites in advance and then instantly select them in Messages later on. You can even use previous stickers as objects in new ones, so one pro tip is to create a sticker with your friend’s name in and a transparent background, then use it in other stickers. If you use other messaging apps, you can export stickers to other apps using the standalone Sticker Fab app, or save them to your camera roll. 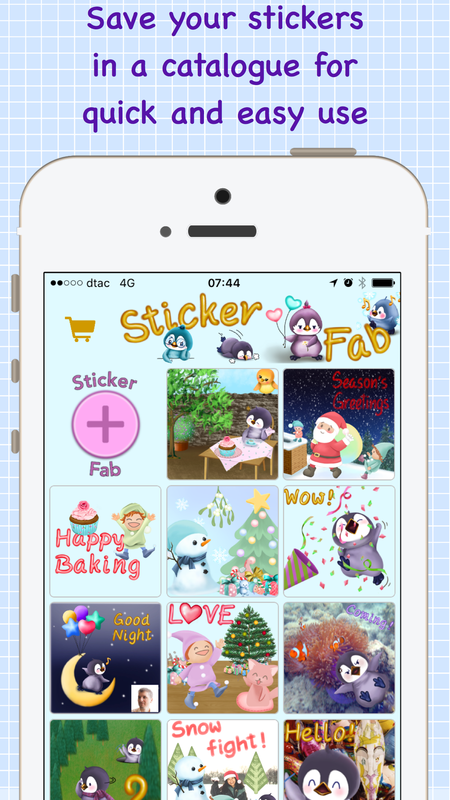 So go ahead, start to make stickers personal with Sticker Fab. Penguin Bo fan? If so, take a look at his other sticker packs, Penguin Bo and Penguin Bo Animated. This is our first sticker pack, launched in September 2016 when Apple first opened the store. The stickers centre around a young Emperor penguin chick called Bo. Penguin Bo also features in Sticker Fab (link), along with his friends and has his very own set of animated stickers (link). The animated stickers take over half of the themes from these stickers and bring them even more to life. If you like these, you may also like the Penguin Bo Animated sticker set that is also on the app store, which features 24 action stickers.